This is for all you guys, living on "The Dark Side of the Moon". 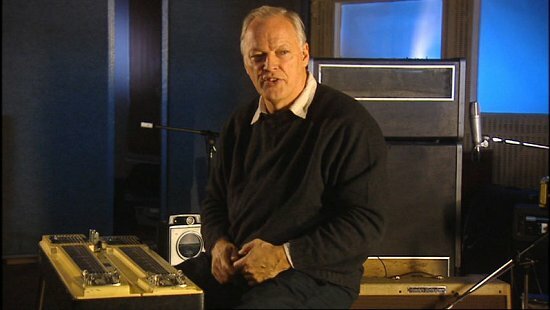 Enjoy an intensive look into the sound of David Gilmour and how to achieve it. 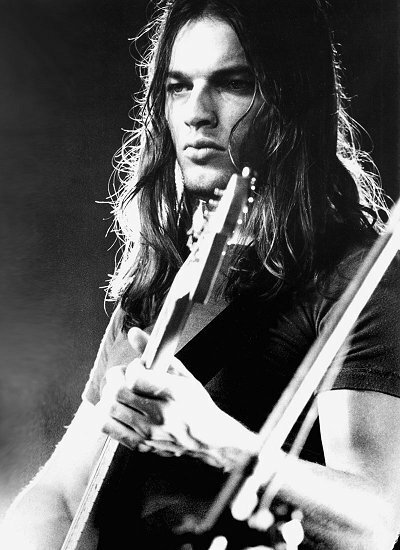 Let's start with an assumption: I love David Gilmour. Let's refine the concept: I love his guitar playing, either the style he deserved to the albums and live acts or the sound he had created. I admire the character himself, due to his formal sobriety and discipline. And I was surprised at the beginning of this "search for a new land" that happens every time I start writing an article about a great musician. I then discovered that in the music business almost everybody knows that he, an amazing guitar player and songwriter, started as a replacement, nothing more than a substitute! Eventually he became a legend, influencing with his musical taste thousands of little musicians, like me and you. Here I would like to introduce Gilmour instrumental setup with both musical and engineer admiration, because we will together discover that he has been a real innovator in his field. Let's start from the beginning, from the sad truth: David Gilmour is not a guitar virtuoso, not as we are used to now-a-days. No flying-picking, no tapping, no hell-on-earth tremolo. On the contrary, gentleness, delicacy, moving bending, phrases and themes that have erupted from his soul directly on the keyboard of his stratocaster... and not only. Yes, here I'm gonna tell you another sad truth: David Gilmour has even not always used strat guitars. He started with a Tele, and he is even using a Les Paul these days! Go and buy his last work, the marvelous "On an Island" and take a look.. or simply hear carefully. Anyway, the timbre is always the same. The hands are always untouched, the style has grown and now like thirty years ago he can play "Comfortably Numb" like he just finished recording it! This is pure magic. The first step in our analysis starts just after the fingers and the pick.. Which pickups does Gilmour use? 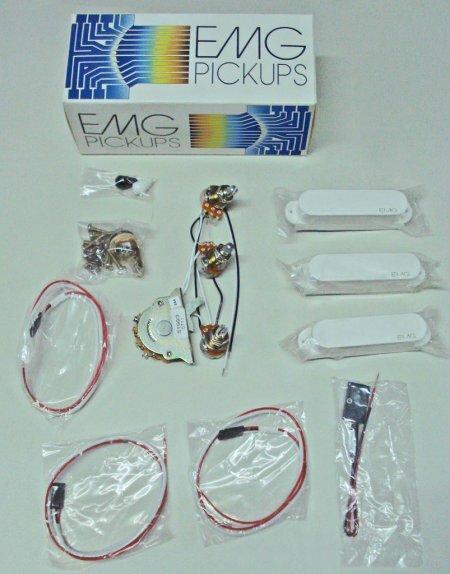 The answer is quite simple: EMG, meaning active microphones, with a dedicated Mid control and a Bass-Treble boost. So to say, not the classic thin Strat sound! Indeed if you take a look at the video of the last eighties performance with Pink Floyd playing "The Wall" you could even find him playing a Gold Top Les Paul with P90 pickups: again, not the usual thin Strato sound. But always, single coil mics. And what about the strings? I've often wondered how can this guy play a high E in the end of Money violin-like solo with a strato neck that has only 21 frets: it's a C-E, two tones bending, at the end of the neck, with not even much that place for his fingers!! So, a part of the secret his here: custom GHS strings with .010, .012, .016, .028, .038 and 0.48 gauges (while for the Les Paul with P90 he uses another GHS set: .010.5-.013-.017-.030-.040-.050). Now I can understand. And then, obviously, he must need a lot of power in order to amplify clearly these thin strings, but for sure he can play that way without destroying his fingers. Other players like SRV preferred to use heavy strings (0.13 and so on..) and detune the instrument half a tone.. but then the keyboarder would hate you. The second part of the magic is a... mistake, i.e. a bass preamp, namely an Alembic FB-2. Actually the gear was Roger Water's, but when they divorced.. no, no, let's be honest. Sometimes road crews make mistakes, so they plugged the preamp to Davids signal chain and then they pretended that it was intentional to try the sound. The fact was, that David really liked it, so he preserved it for the rest of his life. Like other famous guitar players (Mr. May, Mr. Blackmore and so on..) we rediscover the trick: start with a good signal source, amplify it as soon as we can to preserve it from corruptions and noise and then use it trough other hundreds of possible effects. 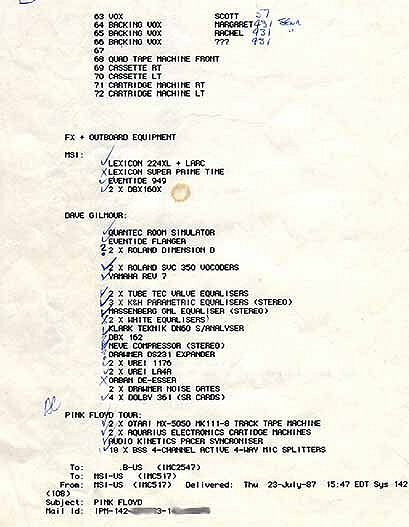 This is really the case of Pink Floyd guitarist, because if we take a look at his 1978 rig we will discover something like 20 different pedals, including Phasers, Fuzzes, Tube Distortions, Delays, Reverbs, Echoes (I'm really proud to say that this ones where the Italian Binson Echorec!!) 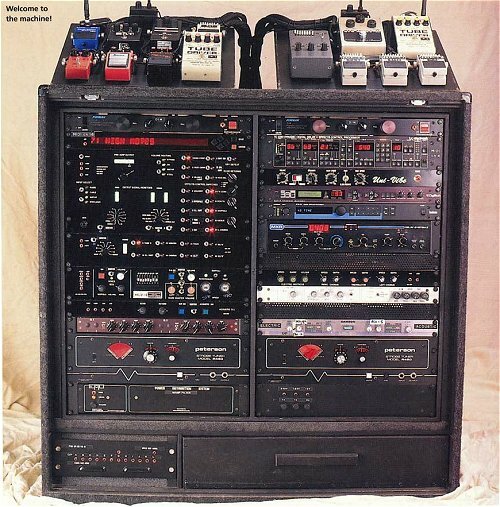 .. Something only a modern MIDI pedalboard controlled rack can fully accomplish! H E R E you can see another pic of DG´s FX setup, built by Mr. Pete Cornish. 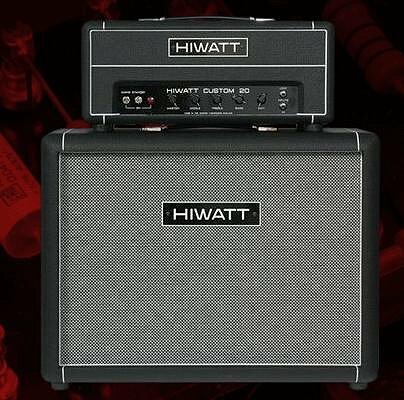 After all these future style electronics, anyway, there are always good old tube amps. Here there are substantial differences between studio and stage. 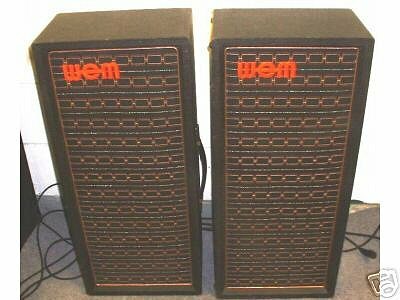 While on stage David used and still uses only Hiwatt amplification and 4x12" WEM speakers, in the studio he prefers to uses several different amps in the same time. Each one is miked with the classic U87 and/or SM57. In the documentary "Classic Albums: The Dark Side of The Moon" you can see him playing in the typical studio environment with an old tweed Bassman amp together with a Leslie 760, a rotating speaker for guitar, a small 50 watt Hiwatt combo with Fane speakers, and so on. Anyway, tube amplifiers. An interesting note comes from an interview he gave to the "Guitar Shop" magazine in December 1996: let's read. Interviewer: Do you mostly cut tracks with your amp in a large room to get your tone and ambiance? DG: I've found that if you use a big amp, it only works in big rooms. And little amps work in little rooms. Most of the tones that sound like that come from fairly large amplifiers in fairly large rooms. But I've got tiny Fender amps that sound positively enormous if you get them in the right place. It's quite amazing. So his personal lesson is, again, to exploit the ambiance of the room. How? Coupling the room with the proper amplifier. Never use a huge stack in a small "dull" room because you'll never be able to really use the power of its sustain and decay.. you'll just make a lot of noise exciting all the stationary modes of you room. On the contrary, let's go for a small 20 or 50 watts combos (or head and cabinet) and let's find a good sounding room, with maybe 0.7-0.9 seconds of reverberation time. And what about the possible "colors" to be applied to his guitar timbre? It would be nice to mimic Gilmours sound, but is it actually possible? We must understand that DG, like many old-school guitarist, loves in the same time the straightforward feeling of footstomp pedals AND the clear studio quality of programmed racks. So, his amazing skill was to develop together with Pete Cornish an extremely powerfull pedalboard that is a REMOTE CONTROL, nothing more. On one side of the stage, or in a corner of the studio he has a rack with several programmable racks and studio quality effects (on for all, the famous Lexicon PCM-70 that he uses for the reverbs..). Then, with his pedalboard he is able to bypass or turn on every single effect singularly and to route the signal through all of them as desired. But, guys.. these seems like modern midi controlled pedalboard. This seems normal today. The dig deal is that he started playing like this in 1975! Of course he exchanged some effects from simple pedals to racks in the meantime, but his capability of foreseeing the future was amazing. Do you want a possible example of use? Let's write some signal paths that he can use while playing his repertoire. Remembering that the Alembic FB-2 is always the first ring of the chain, then we have a strong signal, then a splitter: after that? 1) Today I'm a heavy-mood: I want first the distortion, then the delay, then another Fuzz only on the delayed output, finally a reverb on everything. 2) Today I'm a relaxed-mood: I want first the delay, then the Phaser only on the "effected" output of the delay, then the reverb only on the remaining clean sound. etc. etc. And this could be controlled real-time, meaning that depending on his mood and the context, Gilmour can switch everything on and off! Do you like it? I do.